For modern muscle car fans, a countdown clock ticks for the Chevrolet Camaro ZL1 super pony car’s release early next year. Guaranteed to be a hot commodity among American performance fans, the upcoming 2012 Camaro ZL1’s time on Chevrolet dealership showroom floors could be measured in hours rather than days. The chance to own a special Chevrolet Camaro vehicle can be an obsession for which only price separates us from your ultimate motoring desires. For the fortunate ones who have money readily available, it is only a matter of access for acquiring an early version Chevrolet Camaro ZL1. At the 2011 Barrett Jackson Car Auction in Las Vegas, a special version of the recently SAE certified 580-horsepower Camaro was available for purchase. Securing a high bid of $250,000 in the Saturday evening auction, ownership of the 69th example Chevrolet Camaro ZL1 was handed over in Sin City. While not the coveted first production model, the 69th car has noted significance. Firstly, the numerology of 69 pays homage to the original Camaro ZL1 produced in 1969 with only 69 models built. Secondly, this production version of the Chevrolet Camaro ZL1 model will be the only car featuring a Carbon Flash Metallic outer appearance. The Carbon Flash Metallic exterior colour is also being used on the 45th Anniversary Special Edition trim for the 2012 Chevrolet Camaro. 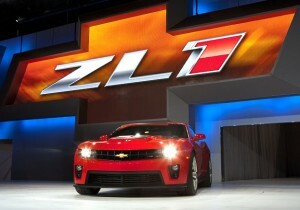 On board this special Camaro ZL1 is the entire performance array Bowtie fans are waiting to find in 2012. The 6.2 liter LSA engine, 6-speed manual transmission as well as the Performance Traction Management system optimizing suspension and Magnetic Ride Control is fitted to the Barrett Jackson auction special vehicle.